Janine has been with the team from the start and her sharp sarcastic wit demonstrates to the team she is not going to take any guff from them! On numerous occasions, Janine has been forced to take up a Ghostbusters uniform and proton pack to bail the guys out of trouble! Yes she has, but she only looked like this once when she did it - and even then, it wasn't real! In the episode "Mr. Sandman, Dream Me a Dream," she was put to sleep by the titular villain, and dreamt herself as a Ghostbuster wearing a pink uniform and high red boots. It's weird that she's the only Minimate to get bootfronts like this. Also weird? Her proton pack is removable! 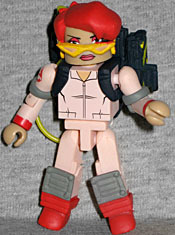 Dozens of Ghostbusters over two movies and a cartoon, and she's the first one to have a removable pack, instead of a chest cap? What the what?! Maybe Art Asylum thought a chest cap would make her too bulky and un-ladylike. Whatever, it's neat. Her hair is the same used for the normal Janine, so it needs a little trim to be its best. Slimer was the first ghost to meet the Ghostbusters team, and "slimed" Peter in their very first encounter. Later, Slimer proved himself not only to be harmless, but helpful, and joined the Ghostbusters as a member of the team, even donning a proton pack to battle other ghosts! He did? That seems irresponsible. 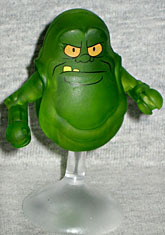 This Slimer uses the same body as the box set version, though he's cast in a foggy green plastic instead of being fully opaque. He's also got a very serious look on his adorable little face: his eyes are angry and his mouth is shut (though two blocky teeth still poke up from his lower jaw). This is a very neat little version of him. Like Janine, Slimer has a removable proton pack. His "backpack straps" are way too wide to be used by any other figures, though. What a shame! The set includes two proton streams for the figures to use, and one open ghost trap. We still need a re-release of the ghost trap energy vortex, though. This really is an excellent set. 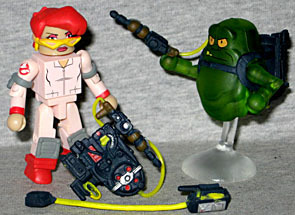 Janine and Slimer are both cool in their own ways, but come on: removable proton pack? Nothing can compete with that. People should be buying multiples just for the proton pack.